After their highly successful April Fools show, Young@Heart ends the month with their 3rd Annual Mash-Up Concert featuring the legendary Young People’s Chorus of New York City and SciTech Band, the pride of Springfield, on Sunday, April 26th, 3PM at Smith College’s John M. Greene Hall in Northampton. Young@Heart and the SciTech Band began the Mash-Up tradition in 2013 when they performed with the PS22 Chorus of Staten Island. Last year it was the Chicago Children’s Choir along with the Hampshire Young People’s Chorus. 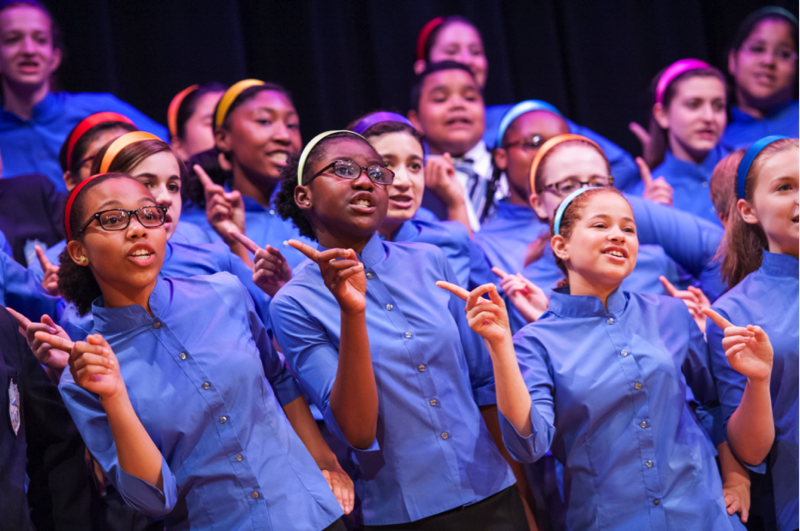 This year the Mash-Up will include The Young People’s Chorus of New York City. YPC is a multicultural youth chorus internationally renowned not only for its superb virtuosity and brilliant showmanship, but as a model for an inclusive society that is being replicated globally. Founded by Artistic Director Francisco J. Núñez 27 years ago, this groundbreaking program harnesses the power of music to fulfill the potential of every child. The group coming for this year’s show will be directed by Elizabeth Núñez. The Springfield High School of Science and Technology Band Program is renowned as one of Massachusetts’ top music programs, known to city residents as “The Pride of Springfield”. Building a quality band in a city with the sixth highest child poverty rate in the United States is said to have been impossible. Fortunately, the SciTech Band has found that nothing is impossible to overcome when students become leaders and take ownership in the classroom. Since January of 2007, the SciTech Band has grown from 20 students to over 500. Perhaps more importantly, students who join the band for more than one year are more than twice as likely to graduate high school. With a strong student leadership team and under the direction of Gary R. Bernice, the SciTech Band is now empowering students to give back to their community by sharing the joy of music. Young@Heart Chorus started out in 1982 at a Western Massachusetts elderly housing project to joyfully pass the time instead of passing before your time has developed into the stereotype-defying, genre-bending, generation-crossing musical extravaganza better known as the Young@Heart Chorus. From The New York Times to TIME, The Tonight Show to The Daily Show and stars of the hit indie documentary, Young@Heart, this group of seniors, ranging in age from 73-92, has toured from Northampton to New Zealand, Europe to Japan, proving it’s “possible to grow old without growing boring” (The Dartmouth). Tickets for the Mash-Up are on sale now at mashup.brownpapertickets.com or call 800-838-3006 or visit Serio’s Market, River Valley Market, and Big Y in Northampton, or Big Y Amherst.